In answer to an email requesting the name and brand of paint if Jack ever painted some of his furniture in an "Old red". Pie in the Turkey pan! 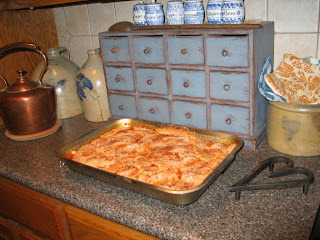 Here is a big one, double the recipe given a few days back. Jack peeled peaches nearly 2 hours for it. The end of the local peach crop is just about here, this may be our last peach cobbler for the year. The pan is about 11 by 17. Before it went in the oven, you can see how the top is covered with 4 bought pie crusts cut up and layered slightly as needed to cover completely. 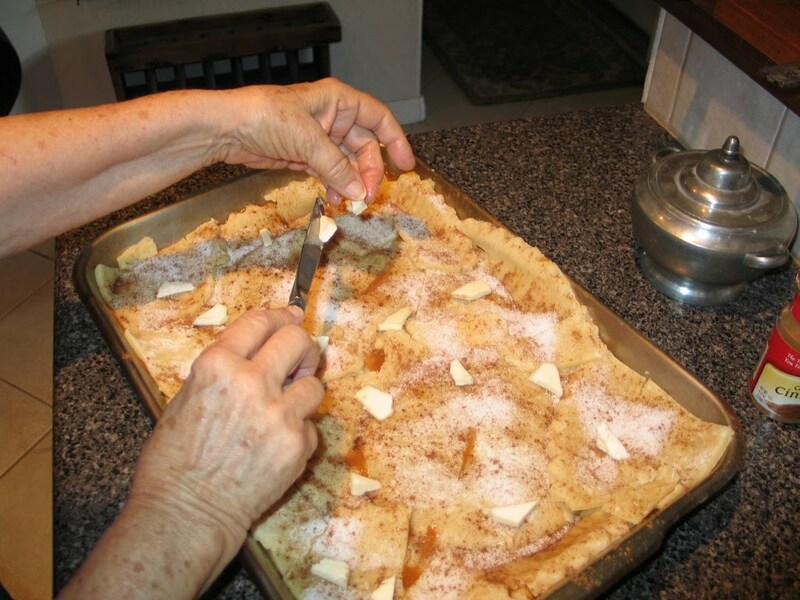 Some years back I stopped making home made pie crust, but still miss it a bit. With sugar and butter and cinnamon added, this one is pretty good! Serve warm with ice cream. We are Incurable collectors and happy that way. A happy morning at the local yard sales! so many times we buy little or nothing, perhaps some small tool or a few old copies of Southwest Art Magzine, or sometimes do not spend even a dime for an hour and half of driving, having risen and dressed and left home at 7 am or before. Weeks go by in futility and then oh wonder of wonders, we find some treasure...a small oriental rug, or a cache of art supplies including many fine brushes, or a piece of Texas stoneware...and this morning look what Jack found! 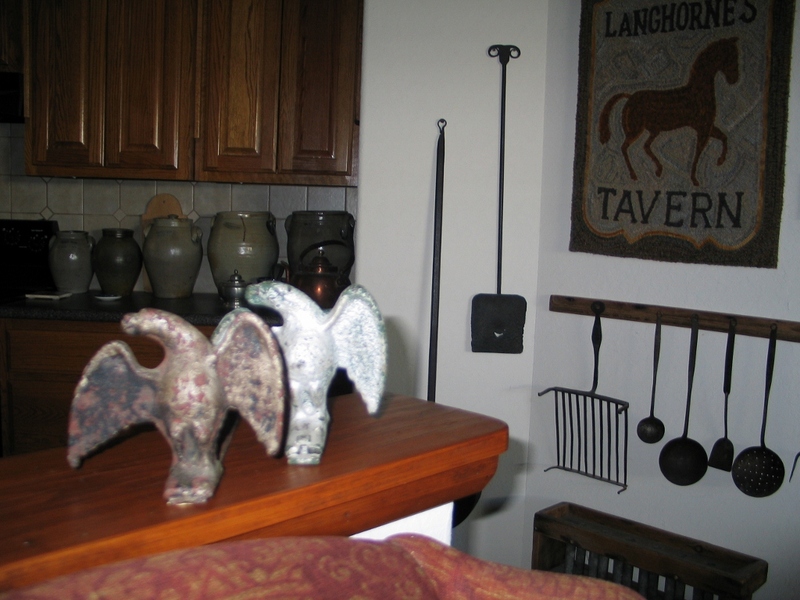 It has been years and years since we have bought any of the humble little iron snow eagles, which once sat in rows on the roofs or northern houses above the entrance to hold the snow from sliding down on the unwary. Sometimes on old homes, we have seen ranks of them all the way across a roof, several feet from the edge, in a fashion to keep the whole snow pack on the roof longer. Was this for insulation? I am unclear why they were so widely used, particularly in Pennsylvania, but they once abounded there on the old homes, and then in the antique shops. There were even some later reproduction ones to avoid. It is fun to find something old mixed in with all the sad and dicarded Beanie babies.